There were a few changes in the second row from the top if you compare it...I have two rows sewn together. Along with this, I started a puzzle...can we say time consuming? I seldom work a puzzle because it is so hard for me to walk away from them. I did okay the first couple days, then Lorelei was here Friday night through yesterday afternoon...so didn't work on it then. I have no good place to just leave it out when she is here. But today I have worked on it every time I turned around. While 'on hold', while waiting for this and that. Which leads to today/this week in general. Roger goes this Wed for patch testing to try to find what he is allergic to. They wanted to know what the insurance will pay. Also, I wanted to sign in to their website...for some reason my password would not work...so had to jump through hoops to do that...next on the phone for at least an hour or more and still did not find out the information I needed. However, I did find out that it is a covered charge. Which means we will probably get a reduced price from the $500 but we will have to pay it. (Deductible) I am at least thankful that it is a covered charge. Oh, and he had to go to the doctor today to get a refill on a prescription...has to go back tomorrow for bloodwork...then he goes Wed for the patch testing, back on Friday, and then back next Monday...fun times are ahead. But what I want to know, do you have trouble working on things when you know you have doctor's appointments ahead. When I was younger, I could work right up to the time I had to get ready to go. Whether it was me going for myself or with Roger. Now, I just almost come to a complete standstill when I know we have a bunch of appointments. Sorry to hear about all the upcoming appts. I do hope they can figure out how to help Roger. We are the same way about upcoming appts. We have trouble concentrating on anything else with that looming over us. Love the Lotus quilt! Siddi eats puzzle pieces, other than online I have put together a puzzle in years. Happy New Year! I don't know how I've been missing your posts! Sorry I haven't been by sooner. Good luck with all the appointments, hope everything will be resolved and find the right treatments. I always fret before appointments...I despise going to the doctor. A big chicken, that's me. I usually worry for nothing. I do pray a lot, but the worry still creeps in. Have a nice week and Happy New Year! The quilt is beautiful and big too. Dr appts are always a pain. I try not to make any---almost ever! I love puzzles--well maybe not love them. they can be so frustrating. I have a corkboard big enough to start the puzzle on and keep it there when I may have to slide it under the bed to get it out of the way. I have several in boxes and haven't worked one in quite awhile. I do hope the docs find out what is going on with roger. that is an excellent question. Mostly because I have been asking myself why I have changed that way. Since I retired, I only want to go out for errands once a week. Once I know we are going to leave the house I can't get anything accomplished. That is part of the reason I keep lap stitching or a crochet project going at all times. Gosh, that's going to be a beautiful quilt! I love working puzzles, too, but haven't done one in a couple of years. Sometimes I do them online, at Jigidi dot com. I prefer the traditional method, however. When we have appointments, I can't seem to get anything else done. To me, it's an interruption in my day. And, I'm usually worn out by the time I get back home that nothing productive gets done until the next day. Between Mike and me, we have four doctor appointments and one test before next Wednesday! The test is already done. Sure do hope Roger's patch test comes up with an answer for him and he can get his issue under control/resolved. I think I'm afraid if I get started doing something else, I'll forget the appointment! So, no, I never accomplish anything in the waiting time. But now I have a coloring book! LOL I don't know how you keep the quilt pieces in order. I'm not up to that on a good day! Hoping all the best for your hubby's testing. All those phone calls/holds/etc. are stressful! Your daughter’s quilt looks lovely! I can’t imagine the hours it takes to put those together. She must have appreciated your help very much. I enjoy a good old-fashioned puzzle but haven’t done one for quite a while now. I have a puzzle program on my computer where you can choose one and make them into as many pieces you want, but as I said it doesn’t beat a ‘real’ one. I bet you had a fun time with Lorelei and family over the holidays. Hope Roger’s allergies get sorted out and with the insurance and all. I don’t do well with appointments, never did. Happy New Year to you and the family Rose. 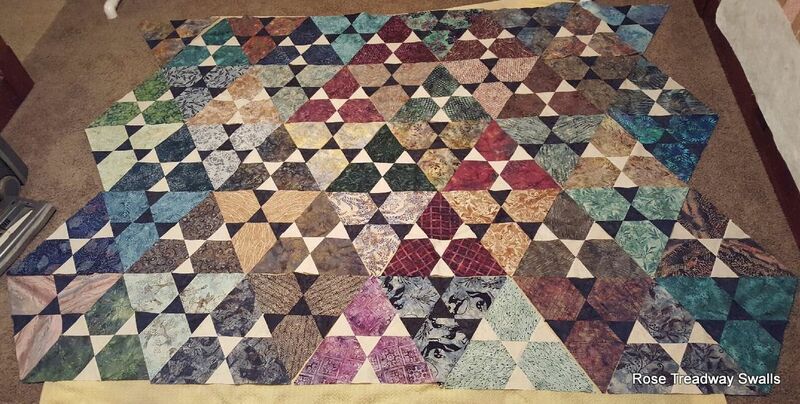 The quilt is a beauty! I do hope Roger's test reveal what he's allergic to! I din't realize it was that expensive to do these tests but it will be totally worth it if he can find relief!